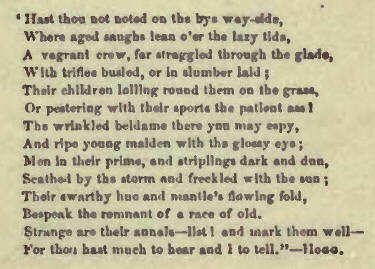 EVER since entering Great Britain, about the year 1506, the Gipsies have been drawing into their body the blood of the ordinary inhabitants and conforming to their ways; and so prolific has the race been, that there cannot be less than 250,000 Gipsies of all castes, colours, characters, occupations, degrees of education, culture, and position in life, in the British Isles alone, and possibly double that number. There are many of the same race in the United States of America. Indeed, there have been Gipsies in America from nearly the first day of its settlement; for many of the race were banished to the plantations, often for very trifling offences, and sometimes merely for being by "habit and repute Egyptians." 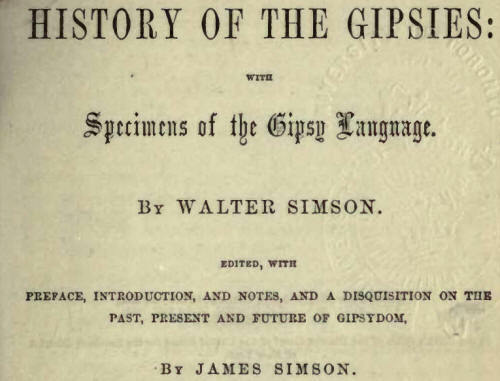 But as the Gipsy race leaves the tent, and rises to civilization, it hides its nationality from the rest of the world, so great is the prejudice against the name of Gipsy. In Europe and America together, there cannot be less than 4,000,000 Gipsies in existence. John Bunyan, the author of the celebrated Pilgrim's Progress, was one of this singular people, as will be conclusively shown in the present work. The philosophy of the existence of the Jews, since the dispersion, will also be discussed and established in it. When the "wonderful story" of the Gipsies is told, as it ought to be told, it constitutes a work of interest to many classes of readers, being a subject unique, distinct from, and unknown to, the rest of the human family. In the present work, the race has been treated of so fully and elaborately, in all its aspects, as in a great measure to fill and satisfy the mind, instead of being, as heretofore, little better than a myth to the understanding of the most intelligent person. 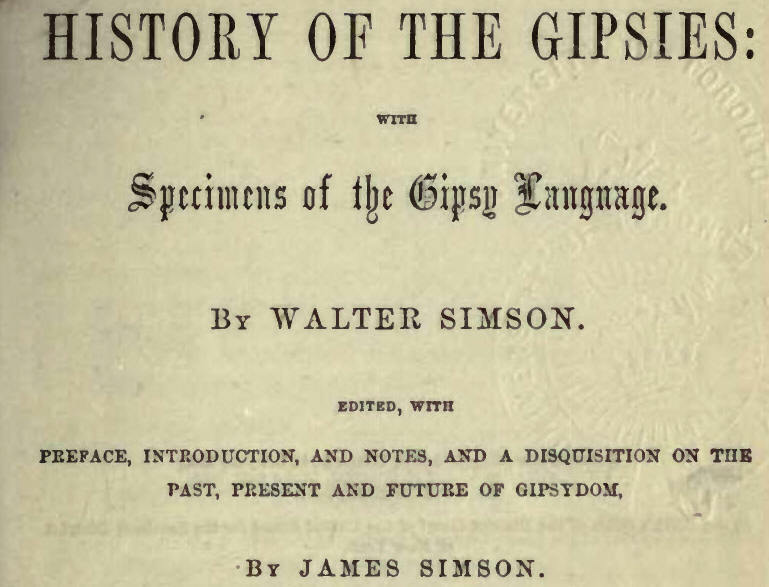 The history of the Gipsies, when thus comprehensively treated, forms a study for the most advanced and cultivated mind, as well as for the youth whose intellectual and literary character is still to be formed; and furnishes, among other things, a system of science not too abstract in its nature, and having for its subject-matter the strongest of human feelings and sympathies. The work also seeks to raise the name of Gipsy out of the dust, where it now lies while it has a very important bearing on the conversion of the Jews, the advancement of Christianity generally, and the development of historical and moral science. NEW YORK, May 1st, 1866. A New study details the grim reality of overcrowded housing and squalid living conditions endured by Scotland's Roma community. UP to 5000 Roma are living in Scotland following a significant influx from eastern Europe in the past 10 years, according to the first comprehensive study of the community north of the Border. However, many are facing a vicious cycle of poverty, unacceptable living conditions and a lack of access to public services, education and employment opportunities, the report has warned. Some turn to crime, including begging, as can be seen on the streets of Scottish towns. Roma representatives in Glasgow are planning to petition the Scottish Parliament to call for an inquiry into the barriers and discrimination facing their community, the Sunday Herald can also reveal. The report comes as global attention has been focused on the ethnic group following the case of a four-year-old girl, known as Maria, found living with a couple who were not her parents at a Roma settlement in Greece. The couple said the girl was given to them by her mother as she was too poor to look after her, but were charged with abducting a minor and detained. On Friday, DNA tests confirmed a Bulgarian Roma couple were her biological parents, with authorities investigating whether the mother had sold her child, a claim which she denies. In the wake of that case, two blond, blue-eyed children were removed from Roma families in the Republic of Ireland amid claims they could not prove their parentage. A seven-year-old girl was taken from her south Dublin home for 48 hours and a two-year-old boy from his home in Athlone overnight. The cases have raised fears about anti-Roma hysteria, with Ireland's police watchdog reviewing the controversial action by Gardai and health officials. Allegations of casual racism were levelled against the Irish police. The Roma people have suffered persecution in Europe for hundreds of years and faced genocide under the Nazi regime. The new study of Roma in Scotland, carried out by the Social Marketing Gateway for Glasgow City Council, found the largest proportion of the population has settled in Glasgow, with the city home to up to 3500 Roma, mainly from Slovakia. Up to 150 Roma are thought to be living in Edinburgh, with 60 in Fife, 45 in North Lanarkshire, around 50 in Aberdeen City and 20 in Falkirk. Around 550 are estimated to be living in other council areas across the country. Many arrived from Eastern Europe as economic migrants following the enlargement of the European Union in 2004 - when Slovakia, Hungary and the Czech Republic became members - and from 2007, when Romania and Bulgaria joined. But Roma are often living in unacceptable conditions in Scotland, the report warns. It finds: "Mostly, Roma live in large family groups in overcrowded housing, often without adequate sanitation and with only limited capacity and connections to access local health, education and other services. "Although less than perfect, these conditions are tolerated because they are an improvement on the living conditions that many Roma people left behind in Bulgaria, Czech Republic, Hungary, Romania and Slovakia." The report says Roma can find themselves living in a vicious circle of poverty, with challenges in accessing education, employment, housing and healthcare. "Some Roma individuals may be forced to turn to off-the-record or even criminal behaviour to provide for their families," the report notes. "This creates a negative stereotype of the whole community." The most stereotypical image of a Roma in Scotland is often of a beggar on the street. On Friday afternoon, the Sunday Herald spoke to three beggars within the space of an hour on the rain-lashed streets in the centre of Glasgow, all of whom said they were from Romania. At least one Roma child - a girl thought to be about 12 - has also been seen begging in central Glasgow. Concerns have previously been raised that Roma beggars may be victims of exploitation and forced to beg by gangmasters involved in organised begging gangs. One 17-year-old sheltering in a doorway, who declined to give her name, said in broken English: "It is very hard. I need the money for food." Immigration rules mean that so-called "A2" nationals from Bulgaria and Romania can enter the UK and remain here if they can prove they are self-supporting. However, they cannot take up employment and have no entitlement to welfare benefits, which some see as a recipe for begging. The report notes the current rules mean many Roma from these countries are surviving at a subsistence level. However, Roma people from other EU countries, including the Czech Republic and Slovakia, can claim benefits and work as they are so-called "A8 nationals" as their countries joined the EU earlier. More than 50% of Big Issue vendors in Scotland are from Romania and are also Roma, it found. They are usually "vulnerable, homeless or living in multiple occupancy property with several generations of one family". It is also estimated around 100 people from Romania - most likely Roma - are regularly begging, mainly in Glasgow and Edinburgh, with most begging organised within families rather than through force or organised crime. The report added: "Contrary to what is probably widespread public perception, this activity [begging] is not widely accepted by other Roma people." The image of Roma as beggars is a stereotype that wearies Marcela Adamova, founder of Romano Lav ("Roma Voice"), a community group based in Govanhill, Glasgow, an area which is home to a large Roma population. She said: "It is not only Roma people who are begging outside. But some people are begging because they have nothing to eat. For example in the case of the Romanians, they are not entitled to benefits and they can't work in this country." Adamova pointed to recent anti-Roma marches in the Czech Republic as an example of the widespread discrimination the community still suffered. She said: "The same attitudes are everywhere. I just think that here [in Scotland] people wouldn't dare to go in the streets and protest openly." She also believes the recent cases in Greece and Ireland have thrown up worrying attitudes and negative stereotypes, while ignoring the bigger picture of the many Roma children who are living in poverty across Europe. And she added: "They should not connect ethnicity with criminality, because ethnicity has nothing to do with criminality." Romano Lav, which is supported by Oxfam Scotland, is planning to submit a petition to the Scottish Parliament calling for an investigation into the barriers faced by people from Roma backgrounds who wish to gain access to public services in Scotland. A report by Govanhill Law Centre last year found administrative delays and inefficiencies were endemic within public authorities dealing with welfare claims from Roma citizens entitled to claim benefits in Glasgow. Just over half of cases were refused based on an erroneous decision, it found. Examples where benefit payments had taken four months to be paid, when it had already taken two years for a favourable decision to be made, were also highlighted. Rachel Moon, a solicitor at Govanhill Law Centre, said the situation was still largely the same today. She said: "They still face the same discrimination issues when they make any sort of applications. "Applications go directly to [the benefits office] investigations unit and they ask for huge amounts of information, more so than they would for any other client." Colin Clark, professor of sociology and social policy at the University of the West of Scotland, believes Scotland needs a Roma integration strategy, as exists in some other European countries. He pointed out that in some countries, such as rural areas of Slovakia, unemployment rates in Roma communities were as high as 90%-95%. Some have speculated whether such high levels of poverty are driven by discrimination and effectively force Roma people into low-level criminal behaviour. Clark said: "That situation is just not tolerable - both morally, but also from a social justice and social inclusion equation. "I would hate to think that situation could happen within Govanhill … I don't think that is likely to happen, but unless there are some actions taken, it has that potential." Clark also pointed out that austere times often led to a "search for a scapegoat", adding: "I can't help but think that has some bearing on what has been happening recently in terms of the Greek and the Irish cases." Campaigners have also raised concerns. Judith Robertson, head of Oxfam Scotland, said poverty and discrimination meant around 90 per cent of Roma in Europe live below national poverty lines. "If it's found the case in Ireland was based on discriminatory perceptions of the Roma community, Oxfam would have serious concerns," she said. "We know that these kinds of stereotypes aren't just held in Ireland or Greece, they are here in Scotland. "In addition, research by the Govanhill Law Centre and others shows that discrimination is having a serious impact on the ability of Roma people to simply get on with their lives." A spokeswoman for Amnesty International Scotland said: "The story of the little girl known as Maria comes at a time when Roma are being pushed even further to the margins of society as a result of forced evictions, are attacked on an ethnic basis, and denied access to education and basic human rights. "Her situation should be considered as an individual case and not as an excuse to attack an entire community." A spokesman for Glasgow City Council said the authority had worked extremely hard in recent years to minimise the social exclusion of the Roma in Glasgow. He said: "Specialist teams, which include members of the Roma community, have been established to address particular issues in employment and social care and there also has been a significant focus on improving educational outcomes. "Assisting members of the community to improve their qualifications and skills will give them access to better opportunities and ultimately help lift them out of poverty. We are taking a long term view, but progress is definitely being made." A spokeswoman for the Scottish Government said £435,000 had been allocated over the next three years to provide additional support for the Roma community in Govanhill. She said: "The Scottish Government is fully committed to eradicating racial discrimination against our most vulnerable communities."